Tada, you’re on mobile mode on your Google Chrome! You get to upload pictures to Instagram from your web browser and do all the things you thought could’ve only done on your smartphone. Head to your Google Chrome webstore and search for ‘Honey’. It’s a coupon app that automatically searches for coupons and sales on sites you shop on. Save some cash, use those coupons. Head to your Google Chrome webstore and search for ‘Chrome Remote Desktop’. This allows you to access another other computers or laptops from your own! It’s great if you’ve left your files on another computer or if you’re trying to teach someone how to do something! 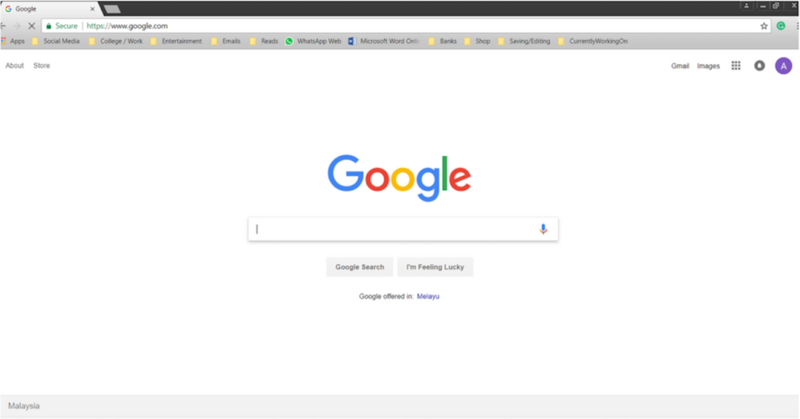 Drag the image you want to search for, if you’re looking for other sizes or something similar to it, and drop it at the Google Image Search Bar. It will redirect you to other sizes of the images (if any) and some similar images. Great for finding materials for your assignments! Head to the Google Chrome webstore and search for ‘Grammarly’. This extension helps check your grammar, looks for misspellings and improves the quality of your writing. Works for emails, social media and more! Never send something with a typo out again! This will bookmark all the sites that are currently open on Google chrome. Great for dissertations and research papers! This helps you reopen and recover the tabs you’ve accidentally closed. Head to the Google Chrome webstore and search for ‘TLDR’. This extension gives you summaries on long articles. Reading is now a breeze! Switch from one tab to the another! What hacks do you have up your sleeve?